The Fair Credit Reporting Act (FCRA) requires each of the nationwide consumer reporting companies — Equifax, Experian, and TransUnion — to provide you with a free copy of your credit report, at your request, once every 12 months. The FCRA promotes the accuracy and privacy of information in the files of the nation’s consumer reporting companies. The Federal Trade Commission (FTC), the nation’s consumer protection agency, enforces the FCRA with respect to consumer reporting companies. If you ever wonder whether or not you should bother obtaining your free reports – you should. Your credit score is your financial lifeline. Guard it zealously.Erroneous entries can and do happen frequently and, unless you monitor your credit at least once a year, you could find yourself turned down for a car or house loan. It’s not unheard of for landlords to check the credit of prospective tenants either. 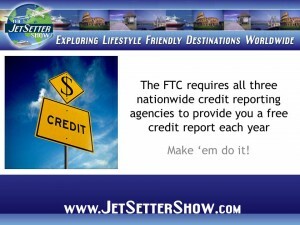 As a public service, Jason Hartman provides contact information for the Big Three national reporting agencies below.